Elephants are highly social animals with incredible memories. This could be attributed to their large brains, which can reach over 5kg in mass! 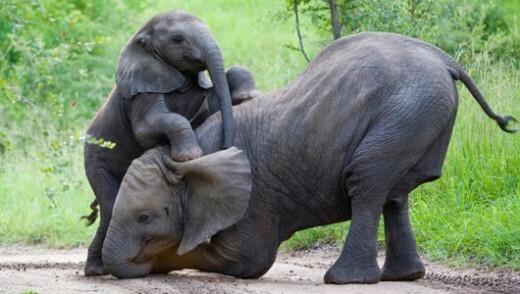 Elephants are smart, social and incredibly strong creatures. An Elephants trunk is so powerful and precise that it can carry calves and also be used for more delicate acts like picking flowers! As the largest land mammal, the Elephant also has the longest pregnancy at 22 months! New-born calves weigh around 90kg and are about 3 feet tall. It is believed that years ago there were more than 300 species of Elephant, however today there only remains two: the Asian and African species. The African Elephant is the largest, with huge ears and unisex tusks. The Asian Elephant has a large body too, but with smaller ears! The females also do not develop tusks for this species. Yes! Elephants live and travel in groups which are led by a matriarch female who tends to be an older and experienced member of the group. Males however, are pushed out of the group when they reach sexual maturity and roam alone when not breeding. Female Elephants are known to show caring behaviour to fellow females and young calves. They are also thought to hold lifelong relationships with family and friends, just like humans do! This act showcases their brilliant memory, which allows them to remember good water hole and feeding locations. There is also evidence to suggest that elephants mourn the passing of conspecifics. They can recognise skulls of other elephants long after they have died, even with the tusks removed! How do Elephants communicate with one another? Elephants are famous for their many vocalisations. This includes chirps, trumpets and high pitched squeaks that can travel far to other groups. Vocalisations are used for both daily communication and to signal willingness to breed. How do we know that Elephants are intelligent? Elephants have displayed complex behaviour indicating that they feel empathy for others, and are capable of demonstrating other emotions including grief. They are able to use tools and recognise themselves using mirrors! Self-recognition indicates a very high level of awareness. Only cetaceans, magpies, humans and other primates have so far been found to recognise themselves in mirrors! What conservation threats do Elephants face? The biggest threat to the Elephant is habitat loss. Clearance of land for agricultural purposes and human development is occurring in both Africa and Asia, leaving little space for the Elephants to roam freely. As the human population grows, forests are lost and food sources for the Elephant are weakened. Read more about how habitat loss can affect a species here. Another important threat comes from the illegal trade of ivory, which although it has been campaigned against since 1989 is still very much present. There have been success stories in many countries where bans and stricter laws regarding ivory imports have been made, whereas other countries see the trade as an economic benefit. In 2016, the U.S. furthered their strict limitations against the ivory trade, and at the 17th CITES CoP meeting such acts influenced others. Although Elephants were not declared an Appendix I species, Botswana, the African country containing over a third of the continents Elephants, announced that they would treat the species as if it were on Appendix I. To read more about the timeline of the ivory battle, click here. Habitat: Open grassland, marshes, savannas and forests. Range: African elephants range throughout sub-Saharan Africa and the rain forest of central and West Africa. Asian elephants live in fragmented areas throughout the Indian subcontinent and Southeast Asia.